Dental implants are changing the way people live. They are designed to provide a foundation for replacement teeth which look, feel and function like natural teeth. The person who has lost teeth regains the ability to eat virtually anything, knowing that teeth appear natural and that facial contours will be preserved. Patients with dental implants can smile with confidence. The implants themselves are tiny titanium posts, which are inserted into the jawbone where teeth are missing. These metal anchors act as tooth root substitutes. They are surgically placed into the jawbone. The bone bonds with the titanium, creating a strong foundation for artificial teeth. Small posts are then attached to the implant, which protrude through the gums. These posts provide stable anchors for artificial replacement teeth. Implants also help preserve facial structure, preventing bone deterioration that occurs when teeth are missing. For most patients, the placement of dental implants involves two surgical procedures. First, implants are placed within your jawbone. For the first three to six months following surgery, the implants are beneath the surface of the gums gradually bonding with the jawbone. You should be able to wear temporary dentures and eat a soft diet during this time. At the same time, your dentist is forming new replacement teeth. After the implant has bonded to the jawbone, the second phase begins. Your Doctor will uncover the implants and attach small posts, which will act as anchors for the artificial teeth. These posts protrude through the gums. When the artificial teeth are placed, these posts will not be seen. The entire procedure usually takes six to eight months. Most patients experience minimal disruption in their daily life. Using the most recent advances in dental implant technology, Your Doctor is able to place single stage implants. These implants do not require a second procedure to uncover them, but do require a minimum of six weeks of healing time before artificial teeth are placed. There are even situations where the implants can be placed at the same time as a tooth extraction – further minimizing the number of surgical procedures. Advances in dental implant technology have made it possible, in select cases, to extract teeth and place implants with crowns at one visit. This procedure, called “immediate loading,” greatly simplifies the surgical process. Who Actually Performs the Implant Placement? Implants are a team effort between an Oral and Maxillofacial Surgeon and a Restorative Dentist. While Your Doctor performs the actual implant surgery, and initial tooth extractions and bone grafting if necessary, the restorative dentist (your dentist) fits and makes the permanent prosthesis. Your dentist will also make any temporary prosthesis needed during the implant process. What Types of Prostheses are Available? A single prosthesis (crown) is used to replace one missing tooth – each prosthetic tooth attaches to its own implant. A partial prosthesis (fixed bridge) can replace two or more teeth and may require only two or three implants. A complete dental prosthesis (fixed bridge) replaces all the teeth in your upper or lower jaw. The number of implants varies depending upon which type of complete prosthesis (removable or fixed) is recommended. A removable prosthesis (over denture) attaches to a bar or ball in socket attachments, whereas a fixed prosthesis is permanent and removable only by the dentist. Your Doctor performs in-office implant surgery in a hospital-style operating suite, thus optimizing the level of sterility. Inpatient hospital implant surgery is for patients who have special medical or anesthetic needs or for those who need extensive bone grafting from the jaw, hip or tibia. Once you learn about dental implants, you finally realize there is a way to improve you life. When you lose several teeth – whether it’s a new situation or something you have lived with for years – chances are you have never become fully accustomed to losing such a vital part of yourself. Dental implants can be your doorway to renewed self-confidence and peace of mind. A Swedish scientist and orthopedic surgeon, Dr. Per-Ingvar Branemark, developed this concept for oral rehabilitation more than thirty-five years ago. With his pioneering research, Dr. Branemark opened the door to a lifetime of renewed comfort and self-confidence for millions of individuals facing the frustration and embarrassment of tooth loss. Why Would You Select Dental Implants Over More Traditional Types of Restorations? There are several reasons: Why sacrifice the structure of surrounding good teeth to bridge a space? In addition, removing a denture or a “partial” at night may be inconvenient, not to mention that dentures that slip can be uncomfortable and rather embarrassing. If you are considering implants, your mouth must be examined thoroughly and your medical and dental history reviewed. If you mouth is not ideal for implants, ways of improving outcome, such as bone grafting, may be recommended. What Type of Anesthesia is Used? The majority of dental implants and bone graft can be performed in the office under local anesthesia, with or without general anesthesia. 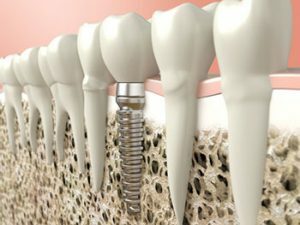 Do Implants Need Special Care? Once the implants are in place, they will serve you well for many years if you take care of them and keep your mouth healthy. This means taking the time for good oral hygiene (brushing and flossing) and keeping regular appointments with your dental specialists. TEETH-IN-AN-HOUR™ is a revolutionary concept providing patients with fully functioning teeth on dental implants in one single procedure that lasts about an hour. This technology was recently developed by Nobel Biocare and allows for collaboration between both the restorative doctor and the surgeon. This merging of knowledge and experience achieves not only increased safety, but also a more precise implant placement. In addition, the fabrication of a final prosthesis is completed prior to the surgery. The computer-guided implant surgery is done in an arthroscopic fashion without requiring any flap reflection. This benefits the patient in that there is less postoperative discomfort, less swelling and less bruising. Patients can often resume their normal activities the next day. The process starts when a CAT scan is taken of the patient’s jawbone. This CAT scan allows for the generation of a three-dimensional model of the jawbone that can then be used in virtual reality software to plan the implant placement without the presence of the patient. The results are more accurate implant placement, and less chair time for the patient at the surgery office. © 2016 Pennsylvania Society of Oral & Maxillofacial Surgeons. All Rights Reserved.